Durable and stylish, this outdoor counter stool was constructed from high quality wrought iron. The stool features a striking open-back design with vertical bars, plus a comfortable mesh seat and subtly winged arms. 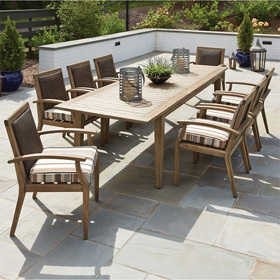 The patio stool is a perfect match for Woodard's outdoor wrought iron counter height tables.